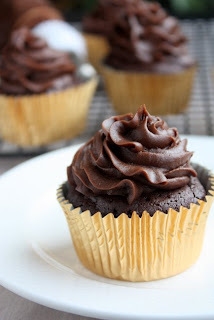 I have been finding some really amazing gluten free things on Pinterest. (Follow me Here). I'm finding that some of my favorite things are either made completely flourless or with a substitute like almond flour. Because let's face it, gluten free flour blends just don't have the same texture. I'm a little eeked out by using almond flour in that it's just ground up almonds - but instead of eating a few almonds (healthy protein), you're eating a ton and a half (yes, that's the exact amount that must go into 1 1/2 cups) of ground up almonds. I'm slightly concerned at the amount of fat and calories that must go into a baked good with almond flour. It might be why I'm not losing weight but gaining. On the flip side, the taste can't be beat. I've also been trying out recipes that just don't have any flour in it at all. These tend to be a lot airier and fluffy as whipped egg whites are used to provide the lift. Again, they're pretty yummy. Then there's this amazing cupcake. No flour and not a lot of eggs. It's dense but not as dense as a normal flourless cupcake. I'm guessing that the cocoa powder replaces the flour, but that's a total guess. You can change up the flavor by using a different type of chocolate chips. I used a very dark chocolate chip and it was an intense cupcake. I would say use the type of chocolate chips that you would most like to eat straight from the bag. And then do as I did and bring them to a party. Because you do not want to be left alone in the house with them. Especially if you frost them with Bailey's frosting instead of cream cheese frosting. Seriously, take me at my word on this one. And we'll give you two little game fanatics. 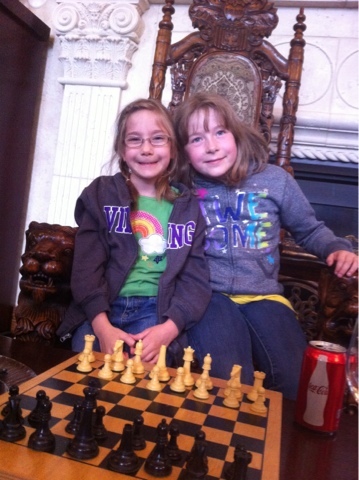 On Saturday we played a bit of chess. Addie had learned in school this year and has practiced a few times with various family members. I had only played once before, and Lily never had. Adam and Addie played a game first, then "coached" Lily and I. It was three heads against one as they conspired to see how badly Momma could play. I think I need a lot more practice. At least I have Risk. Well, I do if the dice roll my way. 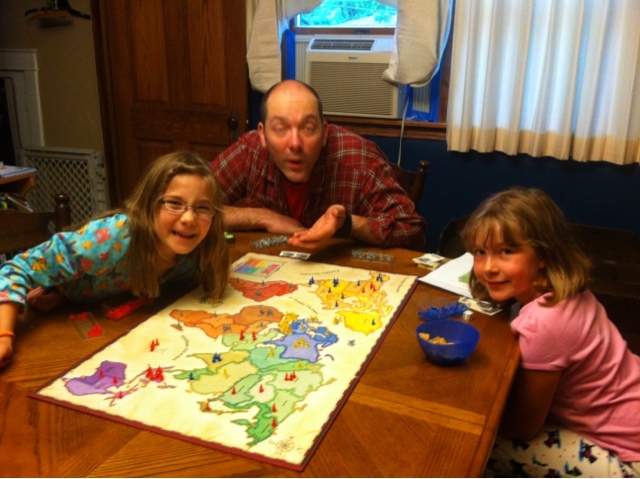 We started a Risk game and have played after supper the last two nights. The girls are fanatical about playing. To the point that they'll willingly get jammies on before playing. We're working on teaching them strategy and thinking several moves ahead. At least that's my strategy. Besides, if they continue playing they will make very smart friends in college.